Sicomin Epoxy Systems (Châteauneuf les Martigues, France) has announced new marine partnerships and is launching a new bio foaming epoxy. The company’s epoxy resins have been selected for ENATA’s (Sharjah, UAE) high performance Foiler motor yacht design. 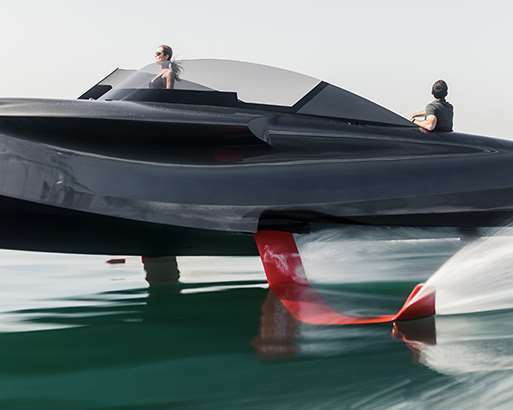 The ENATA Foiler boasts a unique hydro-foiling system capable of flying the yacht 1.5m above the surface of the water. The yacht is constructed of infused carbon fibre and epoxy resin. Carbon fiber provides high strength and stiffness, particularly required for the four foils, and enables the construction of a lower weight hull allowing full lift to be achieved with the hybrid drive system. ENATA chose Sicomin’s advanced epoxy infusion and laminating systems for the hull and structure of the Foiler. Epoxy resin is significantly stronger than alternative resin types, has good fatigue performance and durability, and is proven to work well when combined with carbon fiber in highly loaded structures. Sicomin’s SR8100 epoxy system was used, having been specially formulated for resin transfer processes such as injection or infusion. The system, which boasts the Germanischer Lloyd certification approval, has a very low viscosity at ambient temperature and can be used with different hardeners for the molding of small or large parts, with fast demolding time. Also, H2X (La Ciotat, France) a long-standing customer of Sicomin, has developed the DriX –a new 8m autonomous surface vessel. Made solely of composites, DriX has proven offshore navigation capabilities and a top-speed that is unique in its category, taking the AUSV role several steps further. In addition to these marine partnerships, Sicomin has announced it will launch a new bio foaming epoxy, PB 360 GS, the fifth product in its GreenPoxy offering range of bio-based epoxies. Allowing the in situ production of a shaped low-density epoxy foam core, the two-part system with 37% bio-based carbon content offers good adhesion to a variety of materials and low water absorption. It is particularly suited to foam cored components with lightweight glass, carbon or natural fiber laminates, for example for sporting goods, paddles and surfboards with complex shaped cores.